Proteins represent biology’s workhorse because they fulfill a huge variety of essential cellular roles, ranging from the building block collagen to the antibodies that provide immunological protection and the countless enzymes that catalyze biochemical reactions. Moreover, proteins are amongst the most abundant biomolecules in the cell. For example, it has been estimated that a human cell contains about 20.000 protein-encoding genes that may produce over 100.000 different proteins, while baker’s yeast (figure 1) harbors around 5500 functional genes that yield about 6000 proteins. 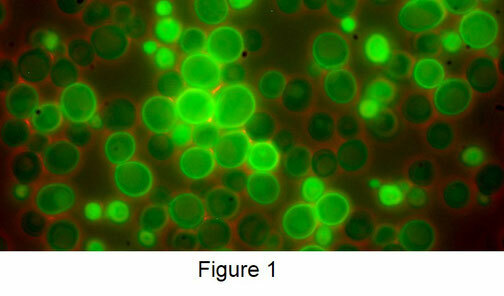 Moreover, it was recently calculated that a typical yeast cell contains 42 million protein molecules (1). It is well documented that proteins are subjected to turnover viz. hydrolysis to their constituent amino acids and replaced by new ones. However, protein turnover rates vary considerably, from as short as a few minutes for the enzyme ornithine decarboxylase to as long as the age of an organism for crystallins in the lens of the eye. These two examples are not representative for the general stability of a cell’s proteome as emphasized by a recent proteomics study of which the results showed that the overall proteome of two different yeasts is remarkable stable with the vast majority of proteins displaying half-lives of 9 to 12 hours (2). For each cell, it is important to maintain a functional proteome through degrading damaged or otherwise non-functional proteins and replacing these with newly synthesized copies (3). 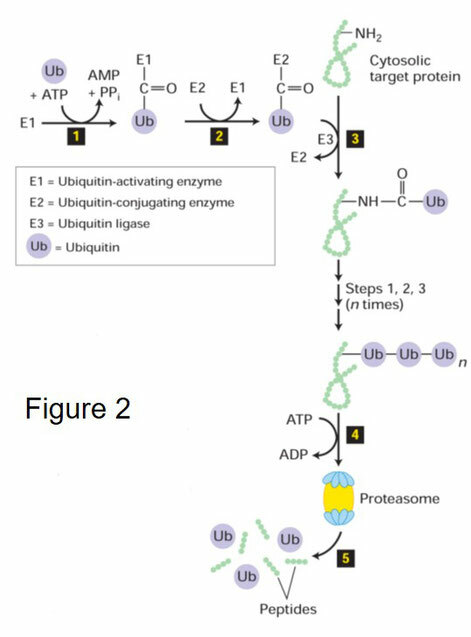 The ubiquitin-proteasome pathway (UPP) represents the most important protein degradation pathway in eukaryotic cells. This is initiated by the posttranslational attachment of ubiquitin, a 76-residue polypeptide, to a lysine residue of a substrate protein (4). Ubiquitin-tagged substrates are recognized and degraded in an ATP-dependent fashion by 26S proteasomes in both the cytosol and nucleus. Most substrate proteins are degraded into short peptides by the proteasome which are released into the cytosol and these are subsequently degraded further by cytosolic proteases into amino acids, whereas some peptides are in mammals displayed on the cell surface as antigenic peptides by the immune system (5). It has been established that the proteasome catalyzes the degradation of at least 80% of the proteins in growing mammalian cells. It plays therefore a key role in modulating the eukaryotic proteome through degrading damaged, misfolded and misassembled proteins as well as regulatory proteins. Consequently, the proteasome also controls a variety of crucial cellular processes such as the cell cycle, DNA replication and signal transduction (5). It is therefore not surprising that malfunctioning of the ubiquitin-proteasome pathway is associated with different devastating human diseases such as cancer and various neurological pathologies, including Alzheimer’s, Parkinson’s and ALS (6). Structurally, the 26S proteasome is a large proteolytic complex of 2.5 MDa made up of a barrel-shaped 20S core particle (CP) and one or two copies of the 19S regulatory particle (RP). The core particle consists of 28 subunits and contains six proteolytic sites with different substrate specificity, enabling the proteasome to degrade nearly all polypeptides in the cytosol (5,7). Proteolysis inside the core particle evolved to separate protein degradation from the cytosol and therefore prevents the non-specific protein breakdown. Access to the proteolytic chamber is controlled by the regulatory particle that is made up of 19 subunits (5,7). The large size of the 26S proteasome precludes structural analysis by conventional protein crystallography, although recent cryo-EM studies have provided high-resolution reconstructions of the proteasome in different conformational states, thereby increasing the mechanistic insight into proteasome-mediated proteolysis (8,9). Here, I will discuss these novel structures as well as the current understanding of proteasome function. Eukaryotes have evolved different intracellular protein degradation pathways. One pathway involves the breakdown of proteins taken up by the cell or defective organelles within lysosomes. These are membrane-enclosed organelles filled with an acidic interior containing various hydrolytic enzymes such as cathepsins B, H and D. Additional mechanisms, distinct from the lysosomal pathway, include degradation by cytosolic proteases like caspases. Most eukaryotic protein degradation mechanisms are in general non-specific and are directed towards a limited set of substrate proteins. In contrast, the vast majority of cytosolic proteins in eukaryotic cells is degraded by the highly selective ubiquitin-proteasome pathway (4). In addition to damaged, malfolded and misassembled proteins, a number of proteins that control essential cellular processes such as gene expression and cell proliferation are targets of ubiquitin-dependent proteolysis. Thus, the ubiquitin-proteasome pathway regulates a variety of key cellular processes, ranging from protein turnover to transcription and quality control. Moreover, antigen display by the immune system also depends on ubiquitin-dependent proteolysis (4). Ubiquitin (Ub) is a polypeptide of 76 residues that is covalently attached to the side chain of a lysine residue of a substrate protein. This is accomplished through a the action of three enzymes (figure 2 adopted from 10), namely: Ub-activating enzyme (E1), Ub-conjugating enzyme (E2) and Ub-protein ligase (E3). E1 and E2 prepare ubiquitin for conjugation but E3 represents the key enzyme of the ubiquitinylation pathway because it recognizes a substrate protein and catalyzes the transfer of activated Ub (4,6). This step is repeated multiple times until at least five Ub molecules are added because a chain of five Ub moieties is sufficient for recognition by the 26S proteasome. The first step in the ubiquitinylation pathway is activation of Ub by E1 in an ATP-dependent reaction. Most mammalian cells contain only a single copy of E1, while 20-40 variants of E2 are known. The large number of these enzymes ensures specificity of the ubiquitinylation system because specific E2s are involved in the degradation of different substrate proteins. Following activation, Ub is transferred from E1 to E2. E3 is the key enzyme of the ubiquitinylation pathway because it catalyzes the transfer of activated Ub from E2 to a side chain of a lysine residue in a target protein. Subsequently, additional Ub molecules are added to a lysine residue in a Ub moiety attached to a target protein, yielding a poly Ub-tagged substrate protein. More than 1000 variants of E3 have been reported and these enzymes confer the greatest specificity to the ubiquitinylation mechanism because they recognize substrate proteins. These enzymes typically recognize basic or hydrophobic residues at the N-terminus of (N-end rule) of proteins destined for degradation by the proteasome (4,6). Ubiquitin-tagged are ultimately marked for degradation by the 26S proteasome in an ATP-dependent fashion. Most substrate proteins are degraded into short peptides by the proteasome which are released into the cytosol (5). These peptides are hydrolyzed further by cytosolic proteases into amino acids. The discovery and biochemical characterization of the ubiquitinylation pathway was awarded in 2004 with the Nobel Prize in Chemistry. The proteasome is a large proteolytic complex of 2.5 MDa formed by about 60 subunits that ubiquitously present in all biological kingdoms. Biochemical and genetic experiments on the eukaryotic proteasome have established that it is probably the most complex protease known with an essential role in protein degradation. The first electron micrograph images of a large protein complex with a cylindrical-shaped, proteasome-like structure were reported in 1968, while almost twenty years later a large protease complex of 600 kDa and made up of 4 rings was first described (11). Subsequently, in 1984 a large oligomeric complex with protease activity was isolated from baker’s yeast which represents the yeast homologue of the mammalian 26S proteasome (12,13). Two years later a 26S protease complex was isolated from a rabbit cell extract that was shown to degrade Ub-tagged proteins (11). However, in 1988 the name proteasome was used for the first time and it was confirmed that previously described protease complexes from different eukaryotic species are in fact the same proteolytic assembly (11). The first 14 genes of the yeast 20S proteasome were cloned and sequenced in the early nineties and functionally linked to proteolysis (12,13). 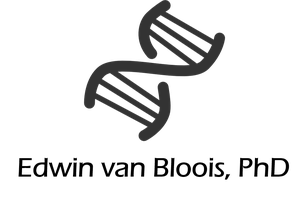 Moreover, it was shown that deletion of 13 of these genes impaired the viability of yeast cells, showing that proteasome activity is essential. Likewise, it was reported that deletion of 26S proteasome genes is lethal in yeast (12,13). Around the same time, the first structural insights into the 26S proteasome were provided by negative stain electron micrographs, showing a cylindrical structure with a cap at each end of the core region (figure 3 adapted from 14). Structurally, the proteasome thus comprises a 20S core particle and a 19S regulatory particle, which is localized at one or both ends of the core particle. The core particle is about 750 kDa and is made up of 28 subunits. Profound structural insight into the core particle was provided by elucidation of its crystal structure in two different conformations (15,16). Both structures are shown in figure 4 and reveal that the subunits of the catalytic core particle are assembled into a cylindrical barrel with an α7β7β7α7 stoichiometry. Hence, the outer rings of the barrel are formed by α subunits and the inner rings by β subunits. The regulatory particle associates with the α subunits. Three of the seven β subunits contain a protease active site that hydrolyze peptide bonds after hydrophobic, basic or acidic residues, respectively. The presence of multiple active sites with a different substrate specificity ensures a rapid degradation of nearly all polypeptides that enter the central chamber of the core particle. 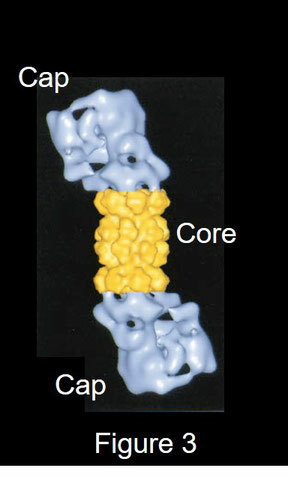 Substrate proteins probably enter the center of the core particle through access channels at both ends the barrel. However, in the structure of the free core particle the hydrolytic chamber is closed to its environment (bottom left panel), while the binding of regulators induces opening of the chamber (bottom right panel). This suggests that the access channel is gated and is opened by binding of the regulatory particle. Moreover, the open access channel is narrow, which ensures that only unfolded polypeptides enter the hydrolytic chamber, while folded proteins are excluded. Recent advancements in cryo-EM technology enabled the structural reconstruction of protein complexes at atomic detail (17). This technique was successfully applied to obtain high resolution models of 26S proteasomes from different eukaryotes, including humans and yeast (5,7). A detailed model of the yeast 26S holo complex, that was recently reported (8), is shown in figure 5 and clearly reveals the 20S proteolytic core (shown in red) and the 19S regulatory particle. The latter is made up of at least 19 subunits and controls substrate access into the proteolytic chamber. Biochemically, it can be divided into a base and lid subcomplex. The base is formed by a hexameric ring comprising six ATPase subunits (Rpt1-6) that belong to the AAA+ superfamily (in blue). These convert the energy of ATP hydrolysis into mechanical force (5,18). The base contains, moreover, four non-ATPase subunits, namely: Rpn10 and 13 that serve as ubiquitin receptor and Rpn1 and 2 that represent scaffold proteins (Rpn subunits are in magenta). The lid subcomplex is made up of 8 additional Rpn subunits (Rpn3, 5, 6, 7, 8, 9, 11 and 12) and a small structural protein Sem1. Rpn11 (yellow), located above the substrate entry channel of the hexameric ATPase ring, is the most important component of the lid. This because it is the only subunit that displays catalytic activity as a deubiquitylating enzyme. Thus, the RP is responsible for the recognition of Ub-tagged substrate proteins, subsequent removal of Ub, unfolding and translocation of polypeptides into the proteolytic core (5,18). The above mentioned technical improvements in cryo electron microscopy enabled the analysis of the substrate-free proteasome in different conformational states, which were obtained by incubating the 26S holo complex in buffers with an increasing concentration of ATP or a non-hydrolyzable analog, ATPγS (8,18). However, the functional relevance of these results is not clear because they were obtained in the absence of substrate proteins. With regards to the latter it should be noted that recently detailed models of the human 26S proteasome in different conformational states were determined at 2.8 to 3.6 Å (9). These structures were captured during the breakdown of ubiquitin-tagged substrates and therefore probably resemble different functional intermediates of the ubiquitin-dependent protein degradation pathway and offer profound insight into the mechanisms by which substrates are recognized, deubiquitylated, unfolded and translocated into the proteolytic core. To obtain these intermediates, purified proteasomes were loaded with a ubiquitin-tagged model substrate, Cdk inhibitor 1(Sic1PY), in the presence of ATP to initiate protein degradation. Subsequently, ATPγS , a slowly hydrolyzable ATP analog, was added to the incubation buffer which is expected to compete with ATP and thereby trapping the substrate-loaded proteasome in different states of the protein degradation pathway. Specifically, conformational states probably corresponding to recognition of Ub, substrate binding, deubiquitylation, initiation of substrate translocation as well as processive translocation were obtained. Figure 6 details the Cryo-EM structures of the substrate-bound human proteasome corresponding to these distinct functional states. The left panel shows a reconstruction of the holo 26S complex with the cylindrical-shaped 20S proteolytic core in red and the 19S regulatory particle with its subunits colored individually. A comparison of the yeast (figure 5) and human 26S proteasome reveals that the overall structure is highly conserved, which is in line with the high degree of sequence conservation of the subunits that make up the yeast and human proteasome, respectively. For clarity, only the regulatory particle is shown in the other panels of figure 6. In the center top panel Ub (in blue) is tightly associated with the ubiquitin receptor Rpn10 (in green). This state, therefore, probably resembles the initial recognition of Ub-tagged substrates by the proteasome. Following the capture of substrate by Rpn10 (right top panel), the Ub moiety is handed over to the deubiquitylating enzyme Rpn11(in purple), while the unfolded substrate (in orange) passes through the center of the regulatory particle. In this conformation, a subcomplex, comprising Rpn11, Rpn8 and Rpt5, is bound to the Ub-tagged substrate protein and stabilizes the Rpn11-Ub contact, enabling efficient deubiquitylation in the active site of Rpn11. Rpn11 is located above the entrance of the ATPase ring, functioning as a gate keeper and controlling the removal of Ub from substrate proteins. Thus, this conformational state of the proteasome most likely corresponds to deubiquitylation of captured substrate proteins. 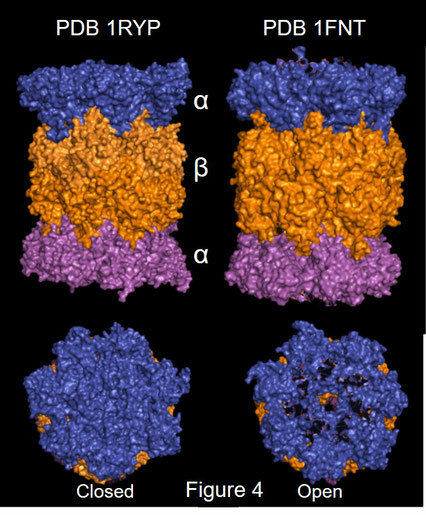 In the next structure (center bottom panel), the substrate (in orange) remains in contact with Rpn11and progresses through the central channel of the ATPase ring towards the closed gate of the proteolytic chamber. In the central ATPase channel, the unfolded polypeptide interacts with aromatic residues that are part of pore loops from the Rpt subunits. These protrude into the channel and it is through these substrate pore loop interactions that substrate-bound ATPases collectively translocate the substrate towards the proteolytic core. Interestingly, Rpt subunits that interact with the substrate protein are loaded with ATP, while substrate-free ATPases don’t contain nucleotides. ADP-containing Rpt subunits are located next to substrate-free subunits and are also in contact with the substrate. However, the physiological relevance of this observation is as yet not fully understood. This conformational state probably resembles initiation of substrate translocation. 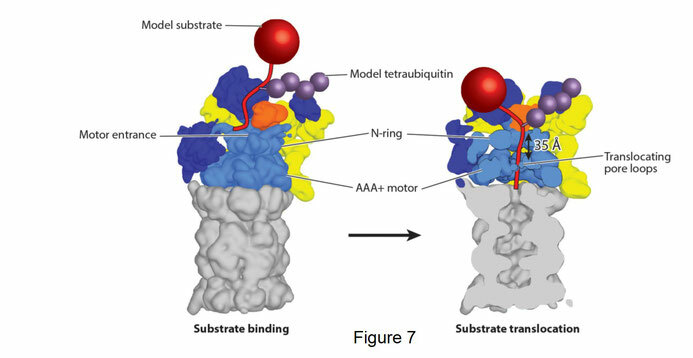 In the next structure, the substrate (in orange) is still bound to Rpn11 and completely traverses the ATPase ring to enter the proteolytic chamber (omitted for clarity). Opening of the central ATPase channel requires a rearrangement of the complete ATPase ring. 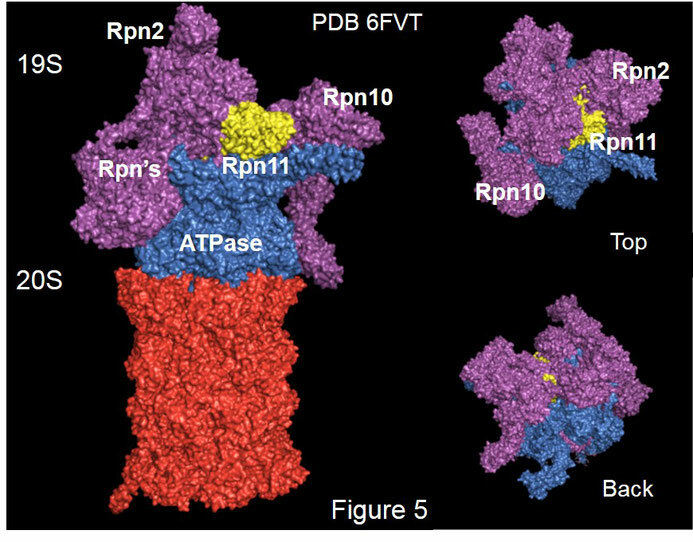 Indeed, a large conformational change in Rpt6 is observed following the capture of a substrate protein and prior to removal of Ub. Hydrolysis of ATP and release of ADP by this ATPase subunit result in an iris-like movement that opens the axial channel. Moreover, translocation of polypeptides into the proteolytic core is also driven by a complex cycle of ATP binding, ADP release and ATP hydrolysis. This process is initiated by ATP hydrolysis and ADP release by Rpt1 and Rpt2, whereas ATP binding by Rpt6 promotes substrate interaction through its pore loop. These events drive conformational changes that result in a one-step forward translocation of the substrate protein by two residues. Subsequent cycles of ATP binding and ADP release by other Rpt subunits results in an additional translocation step of two residues. Substrate translocation requires the concerted action of three Rpt subunits through the binding of ATP to the first one, release of ADP by the second and hydrolysis of ATP by the third. The coordinated action of these ATPases is propagated throughout the ring by other Rpt subunits, thereby powering the vectorial rotation of the entire ATPase ring. Thus, the concerted action of the Rpt subunits controls the complete activity of the proteasome because hydrolysis of ATP drives all steps of proteasome-dependent degradation, including substrate recognition, deubiquitylation and substrate translocation, while the chemical energy of ATP hydrolysis is used for unfolding of the substrate. The current understanding of substrate processing by the 26S proteasome is summarized in the molecular model of figure 7 (adapted from 5). Proteins marked for degradation by the proteasome are covalently modified by addition of a polyubiquitin chain (purple). These ubiquitin-tagged substrates (red) are recognized by ubiquitin receptors (Rpn10 and 13) on the surface of the proteasome. Following substrate binding, Ub is removed by Rpn11 (orange) and a (partially) unfolded region of sufficient length of the substrate protein is captured by the subunits of the ATPase ring. This is achieved through pore loops of their AAA module that protrude into the axial ATPase channel, which enables pulling, unfolding and translocation into the proteolytic core. Here, the unfolded polypeptide is hydrolyzed into short peptides which are released into the cytosol and degraded further into amino acids by cytosolic proteases. It has been established that proteins exhibit markedly different lifetimes but ultimately all cellular proteins are degraded. However, the results of a recent proteomics study showed that the overall proteome of two different yeasts is remarkable stable with the vast majority of proteins displaying half-lives of 9 to 12 hours (2). For each cell it is important to maintain a functional proteome through degrading damaged or otherwise non-functional proteins and replacing these with newly synthesized copies. Eukaryotes have evolved different intracellular protein degradation pathways, although the vast majority of cytosolic proteins in is degraded by the highly selective ubiquitin-proteasome pathway (4). The proteasome is a large proteolytic complex of 2.5 MDa formed by about 60 subunits that ubiquitously present in all biological kingdoms. Structurally, the proteasome comprises a 20S hydrolytic core particle and a 19S regulatory particle, which is localized at one or both ends of the core particle. It has been established that the proteasome catalyzes the degradation of at least 80% of the proteins in growing mammalian cells. It plays therefore a key role in modulating the eukaryotic proteome through degrading damaged, misfolded and misassembled proteins as well as regulatory proteins. Consequently, the proteasome also controls a variety of crucial cellular processes such as the cell cycle, DNA replication and signal transduction (5). Malfunctioning of the ubiquitin-proteasome pathway is, therefore, tightly associated with different devastating human diseases such as cancer and various neurological pathologies, including Alzheimer’s, Parkinsons and ALS (6). Recently, several high resolution structures of the substrate-bound human 26S proteasome in different functional states were presented (9) that are expected to open up new avenues for structure-based drug design. 1. Ho B, Baryshnikova A, Brown GW. 2018. Unification of Protein Abundance Datasets Yields a Quantitative Saccharomyces cerevisiae Proteome. Cell Syst. 6(2): 192-205.e3. 2. Christiano R, Nagaraj N, Fröhlich F, Walther TC. 2014. Global proteome turnover analyses of the Yeasts S. cerevisiae and S. pombe. Cell Rep. 9: 1959-1965. 3. Hinkson IV, Elias JE. 2011. The dynamic state of protein turnover: It's about time. Trends Cell Biol. 5: 293-303. 4. Hochstrasser M. 1996. Ubiquitin-dependent protein degradation. Annu Rev Genet. 30: 405-439. 5. Bard JAM, Goodall EA, Greene ER, Jonsson E, Dong KC, Martin A. 2018. Structure and Function of the 26S Proteasome. Annu Rev Biochem. 87: 697-724. 6. Lecker SH, Goldberg AL, Mitch WE. 2006. Protein degradation by the ubiquitin-proteasome pathway in normal and disease states. J Am Soc Nephrol. 17: 1807-1819. 7. Finley D, Chen X, Walters KJ. 2016. Gates, Channels, and Switches: Elements of the Proteasome Machine. Trends Biochem Sci. 41: 77-93. 8. Eisele MR, Reed RG, Rudack T, Schweitzer A, Beck F, Nagy I, Pfeifer G, Plitzko JM, Baumeister W, Tomko RJ Jr, Sakata E. 2018. Expanded Coverage of the 26S Proteasome Conformational Landscape Reveals Mechanisms of Peptidase Gating. Cell Rep. 24(5):1301-1315.e5. 9. Dong Y, Zhang S, Wu Z, Li X, Wang WL, Zhu Y, Stoilova-McPhie S, Lu Y, Finley D, Mao Y. 2018. Cryo-EM structures and dynamics of substrate-engaged human 26S proteasome. Nature. doi: 10.1038. 10. Molecular Cell Biology, 4th edition. New York: W. H. Freeman; 2000. 11. Baumeister W, Cejka Z, Kania M, Seemüller E. 1997. The proteasome: a macromolecular assembly designed to confine proteolysis to a nanocompartment. Biol Chem. 378: 121-130. 12. Hilt W, Wolf DH. 1995. Proteasomes of the yeast S. cerevisiae: genes, structure and functions. Mol Biol Rep. 21: 3-10. 13. Coux O, Tanaka K, Goldberg AL. 1996. Structure and functions of the 20S and 26S proteasomes. Annu Rev Biochem. 65: 801-847. 14. Baumeister W, Walz J, Zühl F, Seemüller E. 1998. The proteasome: paradigm of a self-compartmentalizing protease. Cell. 92: 367-380. 15. Groll M, Ditzel L, Löwe J, Stock D, Bochtler M, Bartunik HD, Huber R. 1997. Structure of 20S proteasome from yeast at 2.4 A resolution. Nature. 386: 463-471. 16. Whitby FG, Masters EI, Kramer L, Knowlton JR, Yao Y, Wang CC, Hill CP. 2000. Structural basis for the activation of 20S proteasomes by 11S regulators. Nature. 408: 115-120. 17. Fernandez-Leiro R, Scheres SH. 2016. Unravelling biological macromolecules with cryo-electron microscopy. Nature. 2016 537: 339-346. 18. Wehmer M, Sakata E. 2016. Recent advances in the structural biology of the 26S proteasome. Int J Biochem Cell Biol. 79: 437-442.